Sleep problems and depressed mood go hand in hand, forming a frustrating cycle. Michael Terman has analyzed the brain functions that feed these disorders. 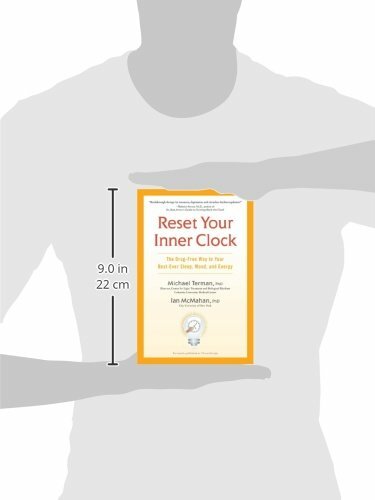 In Reset Your Inner Clock, he reveals the heart of his findings, a powerful program that recalibrates our internal clocks–our exquisitely designed sensitivity to the timing and brightness of light exposure. He shows how these need to be tuned to the modern demands of a 24/7 society. Beginning with a questionnaire that pinpoints the problem areas, Terman helps readers decipher when their natural internal night begins and ends. The treatment process then begins, incorporating the power of natural light with supplemental light therapy. His program has brought relief to thousands of sleep sufferers, as well as those burdened by bipolar disorder, seasonal affective disorder, depression, sleep disorders due to shiftwork schedules, and other impediments to vibrant health. External vs. Internal Time: The clock on the wall measures twenty-four hours every day, but the clock in your brain runs a little different. How can you help them work together? The Pressure to Sleep: The longer you stay awake, the more pressure you feel to sleep. But what if your inner clock says it is not yet ready for sleep? Owls, Larks, and Hummingbirds: What kind of “bird” are you? And once you know, how can that help you figure out when best to get stuff done? Getting Light into the Brain: How do your eyes pass signals to your inner clock, and what makes those signals so important? Getting Light Wrong: Seeing light and being in darkness are basic daily experiences. But what happens when they come at the wrong times, and why does that have such negative consequences for mood, alertness, and sleep? Geography and Time: East or west, south or north, how can where you live have such a huge impact on your mood and sleep? Healing Light: How can light help you solve your sleep problems, have more energy, and feel more positive about life? Why do the details matter so much? Nighttime Meds and Melatonin: Do you rely on pills to get to sleep? They may not work, and they may be bad for you. But a new approach based on the brain’s inner clock holds great promise. Hospitalized with Depression: When someone becomes so depressed they need to go to the hospital, what promise does chronotherapy offer for a quick turnaround and continued improvement? Beyond Light: The Charge in the Air: What is it about spending a day at the beach that gives you such a lift? And how can you use new technology to bring that feeling of wellbeing into your home? The Promise of Pregnancy: You are going to have a baby! You are thrilled, but a little apprehensive too. How can chronotherapy help you through the next nine months? Strategies for Babies and Children: When your baby or child sleeps well and feels good, you feel better too. How can chronotherapy help you reach this goal? The Challenges of Adolescence: As a teen, why do you feel the need to stay up so late and sleep so late? What are the consequences for your mood, health, and schoolwork? What simple steps can you take to put your life on a smoother course? In Later Years: Does getting older have to mean being tired, sleeping badly, and feeling down? How can you or someone you care about reverse these trends by using light? Coping with Shift Work: What if your job puts you on duty when your inner clock says you should be asleep? How can chronotherapy help you stay awake, alert, and in a decent mood? Racing the Clock, Racing the Sun: You are traveling across the world and you need to be in high gear tomorrow. How can chronotherapy prepare you for the trip and help you recover from jet lag? Chronobiology in the Home and Workplace: How will the collaboration of chronobiologists and architects transform the places you live, work, and learn? Dawn of a Circadian Science: Why is mainstream medicine so slow to put the insights of chronotherapy into practice? 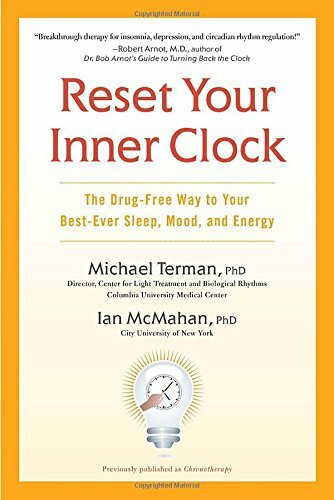 Michael Terman Ph.D., Ian McMahan Ph.D.